Gypsy Wood Park FarmEveryone in the family will love a day out at Gypsy Wood Park! We are one of North Wales’ top family attractions, and with a huge range of attractions and things to do for all the family, you’ll be sure of a fun-filled family day out. Come and meet our friendly animals, take a ride on Woody’s Train, try your hand at one of our family games, run wild in our outdoor play areas, make some music in our tree house and see if you can spot all of our fairies on the fairy hunt and lots more, all set in 20 acres of beautiful natural Welsh woodland. And don’t forget to pack your wellies for the woodland walk and write up your wishes for the Fairy Princess. So why not come and make happy holiday memories with us here at Gypsy Wood Park? Open March to September (check website for specific dates, Halloween/Christmas events). We will be open daily from 10.30am to 5.00pm. Please note that in inclement weather we may close early, or in severe conditions we may remain closed for the day. 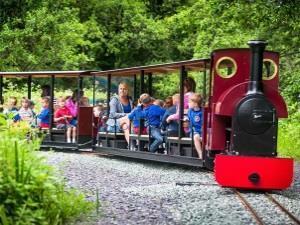 The largest garden railway in the Wales, miniature animals (Shetland, donkeys, goats etc), 1.5 mile land walk, picnic areas, children's play area. Café, shop, outdoor attraction. A must for all animal, train & nature enthusiasts. Easter to mid September 10.30am - 5.00pm daily. Take the A487 out of Caernarfon, heading South towards Porthmadog. Take 1st exit left onto roundabout at Bontnewydd. Attraction 500 yards on left.